Here's a quick urban/suburban survival test. Go outside your house and pretend you're a bird or squirrel or, if you're anything like some of the people in the Grinning Planet neighborhood, a toad. Now, here's the test: Get yourself a drink of water. Remember, no hoses, no 7-11s, no coolers full of cherry-lemon "water beverage." And also remember that you can speak only in chirps, cheeps, croaks, and clicks (or whatever noises a squirrel makes), so no asking the people next door, either. If you get reeeeally thirsty, that low spot in the road where the water hasn't quite yet evaporated may start to look pretty good. Mmmm... Oily. The sad fact is that urban and suburban "watering holes" can be few and far between for the critters that have figured out how to live in this altered habitat. Most housing developments had their wet areas drained and their streams put underground in storm sewers when they were first built. Animals need water throughout the year. You can help by simply putting a low dish of water on your deck, patio, or back lawn. A cut-off bottom from a gallon-sized plastic jug of milk or water is perfect. If you're more industrious, you might install a bird bath, but the low dish in the yard is still a good idea, since critters such as toads, rabbits and turtles need their water close to the ground. If you like serious around-the-home projects, consider building a back-yard pond. 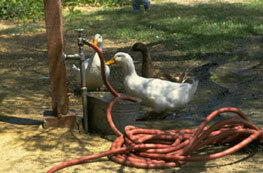 That's the ultimate in watering holes for your furry and feathered neighbors. In terms of placement, the National Wildlife Federation points out that, as with birdfeeders, you should place birdbaths or water dishes in locations that do not provide hiding places for cats and other predators to wait in ambush (i.e. put them about 5-12 feet from low shrubs or bushes). During winter months, temperatures can drop below freezing and the water in your bird bath may freeze over. If this is a problem in your climate, consider using a low-energy bird-bath heater designed to keep the water just above freezing. If you're doing the low-dish method and the temperature usually manages to get above freezing during the day,	you can just chuck out the block of ice every morning and add fresh water. Whatever your water receptacle, be sure to change the water in it every couple of days to keep bacteria levels down and to make sure mosquito larvae don't get a chance to become all-grown-up. 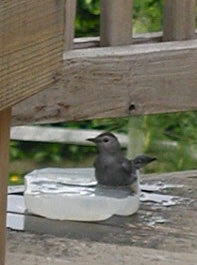 It's not a bad idea to scrub the surfaces of your birdbath or dish once in while, too. It brings us a little closer to nature to see furry and feathered animals near our homes. Providing them with water makes our homes a little more like THEIR homes once again. Features a practical approach to integrating water features into your backyard landscape. Includes how-to info, plant recommendations by region and by function, a resource list, and excellent photographs. You can have your very own wetland! ... or just a normal lined pond. "I value my garden more for being full of blackbirds than of cherries, and very frankly give them fruit for their songs."